Rogers Middle School student Ella White recently won an LA Galaxy meet and greet with her art contest submission on science, technology, engineering and math. The youth sports company Sports for Learning brought Ella and her parents to an LA Galaxy soccer game to celebrate the student’s winning drawing. Ella got to walk down the players’ tunnel and meet Galaxy player Sebastian Lletget. In addition, representatives of the LA Galaxy Star Squad spirit team visited Rogers to celebrate Ella’s accomplishment. Kris Damon, an early transitional kindergarten teacher at Bixby Elementary School, recently received the 2018 Delta Kappa Gamma (DKG) California Distinguished Career/Professional Service Award during the organization’s annual convention in Irvine. This award is given annually to recognize a DKG California member who has developed an innovative educational activity that has impacted the profession and is recognized as an example for other educators. Damon was honored for her innovative work with Transitional Kindergarten in LBUSD. One of DKG California’s purposes is to honor women of distinction in the field of education. Damon was instrumental in creating a pilot program known as Preppy Kindergarten, which led to the creation of Transitional Kindergarten in LBUSD and across the state of California. In addition to her classroom teaching, Damon served as an instructional coach for Transitional Kindergarten and has represented the district on committees and at conferences on the topic of Transitional Kindergarten. Also attending the award ceremony was Jill Baker, deputy superintendent of schools, who wrote a letter in support of Damon’s nomination. Jordan High School senior Kristina Hale qualified for the Special Olympics of Southern California Summer Games at California State University, Long Beach June 9 to 10. Learn more at sosc.org/summergames. Conrad Marcano, a member of the Class of ’03 at Poly High School, was among 646 American Airlines pilots hired last year, and he was one of only 60 who did not come from a military background. More than 17,000 pilots applied to American Airlines last year. He was also the youngest new hire in his class. Marcano has completed his first year as a Boeing 737 First Officer. He recently conducted three presentations at King Elementary School’s Career Day. 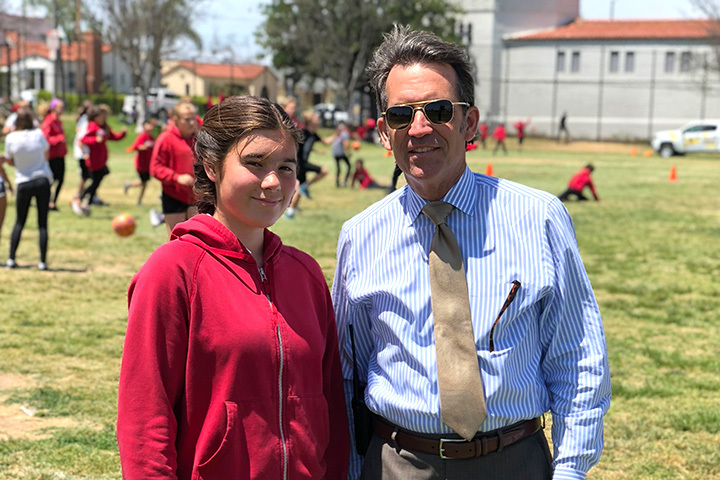 ART CONTEST WINNER – Rogers Middle School student Ella White, pictured with Principal Doug Jordan, won a meet-and-greet at an LA Galaxy soccer game.